Feminists in Space was an international performance festival curated by Kajsa Dahlberg, Molly Haslund and Gritt Uldall-Jessen at Warehouse 9 in Copenhagen on November 9-13 2011. It contained a broad program of artists whose work is informed by feminist and queer theory. We are pleased to announce Feminists in Space – the first feminist performance festival ever to be held in Copenhagen. Feminists in Space was initially the title for a feminist blog that one of the curators was once part of setting up. We have now drawn this title out of cyberspace in order to use it for the manifestation of feminism as part of our common universe. Feminists in Space is an international festival that is also locally based. It contains a broad program of artists whose work is informed by feminist and queer theory. 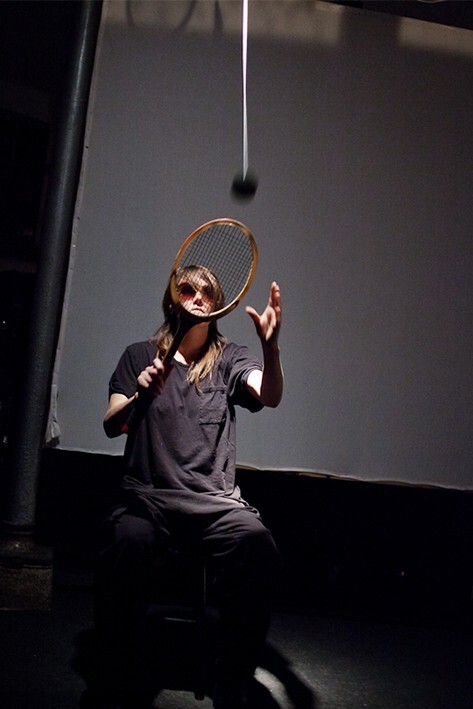 One aim for the festival is to mirror the diversity and complexity of performance art, while having a specific focus on artistic practices navigating the field between art and politics. The questions at issue being brought up discuss the identity positions that operate in the intersection between gender, sexuality, age, nationality and class that, on different levels, constitute the loss of or access to privilege and power. At the same time, Feminists in Space is a room for works dealing with feminism from the perspective of the artists’ personal interpretation. It is a space to test new ideas and to experiment. The two scenes will be transformed from day to day, and thus change the character according to the specific works and wishes of the artists. Malin Arnell (SE), Aktionsgruppen LA BARBE (FR), Charlotte Bergman Johansen (DK), Musikperformancegruppen Damenkapelle (DE), Living Dialogue Room (DK/NO), Sara Hamming (DK), Ulla Hvejsel (DK), Jeuno JE Kim (KR/SE), Mette Kit Jensen (DK), Kirsten Lindholm Astrup (NO), Annika Lundgren (SE), Anna McCarthy (DE), Trine Munk (DK), Mille Rude (DK), Ingrid Skovgaard (NO), Scenekunstgruppen TIR (SE), Maria Werger (DK) and Marit Östberg (SE). Lectures by Mikkel Bolt (DK) and Laura Luise Schultz (DK). DJ: Cecilia Flink (SE) and Imri Sandström (SE). Malin, Kajsa, Clara, Marit & Imri were the source(erer)s of inspiration for this tune that in all its basic components was thought out at the festival at Warehouse9 in Copenhagen 9-13 November 2011 you who were there will perhaps recognize some of the words but most of all the ambience.